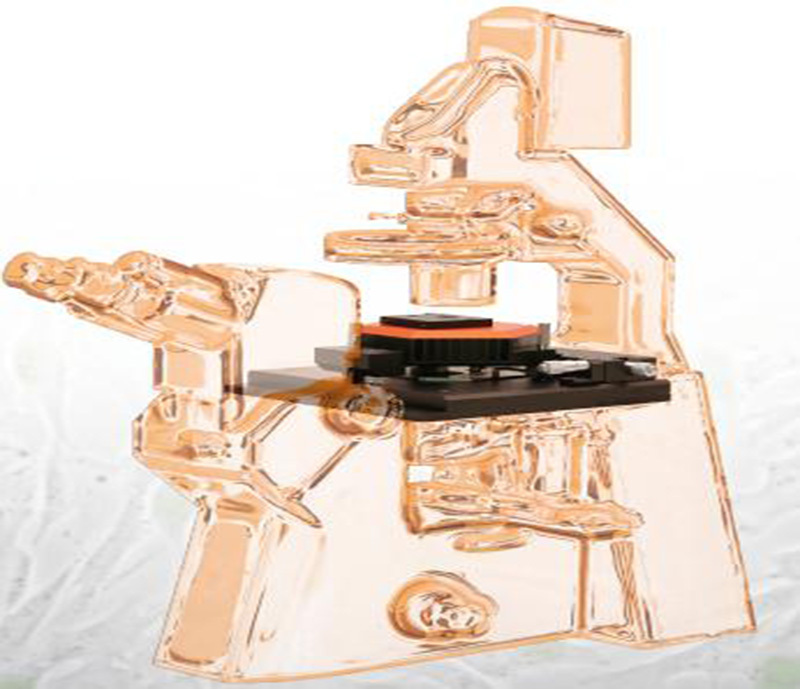 In the new and fast growing market for nanotechnology and its applications, Nanosurf has committed itself to smart solutions in the area of scanning probe microscopes and positioning devices with nanometre resolution, as well as being a solution provider of new nanotechnological implementations in the future. Miniaturization has been successful in most of the industrial parts and has led to lots of new, innovative solutions. The process of miniaturization has now reached the nanometre range and will therefore inspire new applications and continue to play an important role in industrial development. CoreAFM — The essence of AFM. The CoreAFM is the result of intelligently combining the core components of AFM to achieve maximum versatility and user-friendliness. Due to this fundamental design approach, the CoreAFM is equipped to perform AFM at its best. See for yourself how easy it is to prepare and operate the CoreAFM. Watch the video for a demonstration of the main features, and a brief tutorial on how to perform a measurement using this system. The fusion of a modern flexure-guided scanner, XYZ sample stage, camera, active vibration isolation table, and acoustic shielding in a single all-in-one unit results in a complete AFM system with an unparalleled compact footprint. The system comes with a fully digital 32-bit controller developed specifically for the CoreAFMscanhead. All the essential functions of modern AFM are integral components of the CoreAFM system; all you need to do to take the CoreAFM into operation is connect the controller, and plug in power and USB. State of the art electronics with 24-bit ADC and DAC ensure high-resolution XYZ driving of the 100×100×12 µm scanner and allow for low-noise force detection limited only by the cantilever. Thirty-two standard and optional modes with fully compatible add-ons make the CoreAFM the tool of choice for applications ranging from materials research to life science and electrochemistry. 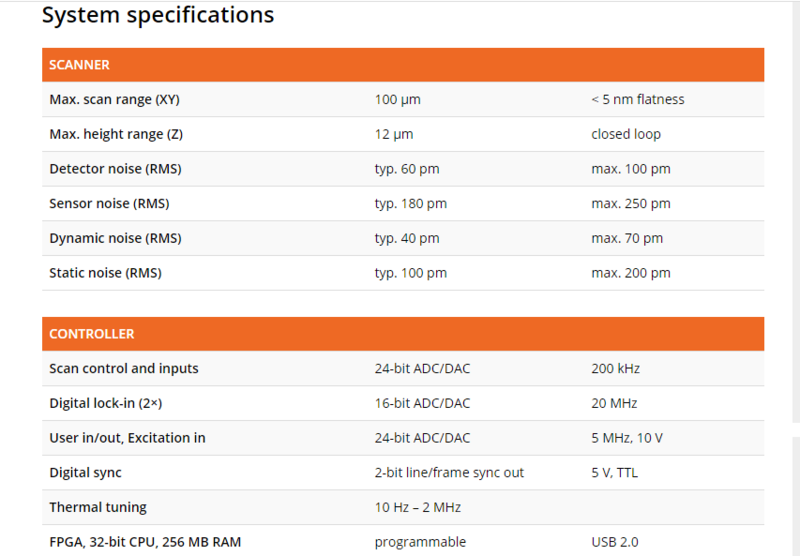 Starting from the basic CoreAFM system, its functionality can be seamlessly extended. Deeper system integration of the Isostage is reflected in the unique SpikeGuard, which eliminates glitches during imaging. Although the Isostage is an active vibration isolation system, glitches can still occur when distortions are too severe. SpikeGuard detects such anomalies and rescans the line for a distortion-free image. The CoreAFM can perform static force, dynamic force, phase imaging, MFM, lateral force, force modulation, standard spectroscopy, and standard lithography out of the box. You can however enhance your measurement experience with CoreAFM mode kits. By default, the CoreAFM comes with the static force mode kit, dynamic force mode kit, and phase imaging mode kit to get you started right away. Depending on the measurement mode, a mode kit may include samples, suitable cantilevers, accessories, or a combination thereof. Additional standard-level mode kits that can be acquired separately are the standard spectroscopy kit, standard lithography kit, standard MFM mode kit, standard liquid mode kit, lateral force mode kit, and force modulation mode kit. 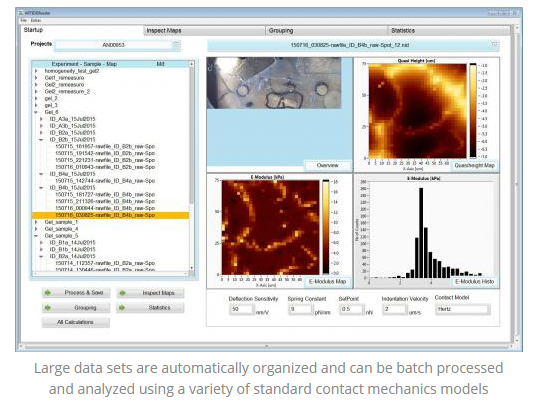 Advanced AFM modes and functionality like sample heating, environmental control, scripting, and many others can easily be added to your CoreAFM. For details and dependencies, see the overview graphic above and the primary and secondary add-on lists in the sidebar. The minimalist and integrated design eliminates the need for additional acoustic shielding, camera housing, and so on, thus making every remaining component essential to its function. Less is more in the case of the CoreAFM, more value for your money. The CoreAFM and its accessories have been designed as part of a consistent system concept. The result is an integrated, high-quality, high-performance, and versatile AFM system that offers the best price-to-performance ratio on the market. An atomic force microscope that is easy to use, robust, and easily extendable. The CoreAFM brings you back to the essence of AFM: the measurement, not the machine! Flex-Axiom — AFM for materials research. For success in materials research studies, scientists depend on professional tools that can readily provide the information needed, regardless of the tasks at hand. By advancing key technologies and designs, Nanosurf has made the Flex-Axiom one of the most versatile and flexible AFMs ever, allowing a large variety of materials research applications to be handled with ease. Together with the powerful C3000 controller, complex material characterizations are possible. The Flex-Axiom is your reliable tool for topographical and metrological imaging of samples in both air and liquid. But the Flex-Axiom goes beyond topography, for example with advanced mechanical, electrical, or magnetic characterization. The system has also been successfully used for local sample manipulation. The Flex-Axiom uses an extremely linear electromagnetic scanner for XY movement. This scanner delivers an average linearity deviation of less than 0.1% over the full scan range, top-ranking on the AFM market. The Z-axis is piezo-driven, with a position sensor that enables closed-loop operation. A sensitive cantilever detection system can measure well into the MHz frequency range. The scan head is connected to the full-featured, 24-bit C3000 controller with digital feedback and 2 dual-channel lock-in amplifiers. With a modular stage concept and various possible cantilever holder types, the Flex-Axiom is ready for all your current and future needs. On the C3000 controller, 14 AFM operating modes have already been implemented, with more to follow, allowing highly advanced measurements and experiments in the field of materials research. The ECS 204 electrochemical stage, for example, provides electrochemical and environmental control over the sample and its surroundings, resulting in exciting new discoveries. Together with some of our high-end research customers, custom solutions for large-area nano-lithography, operation in a glovebox, and magneto-resistive sensing have been developed. 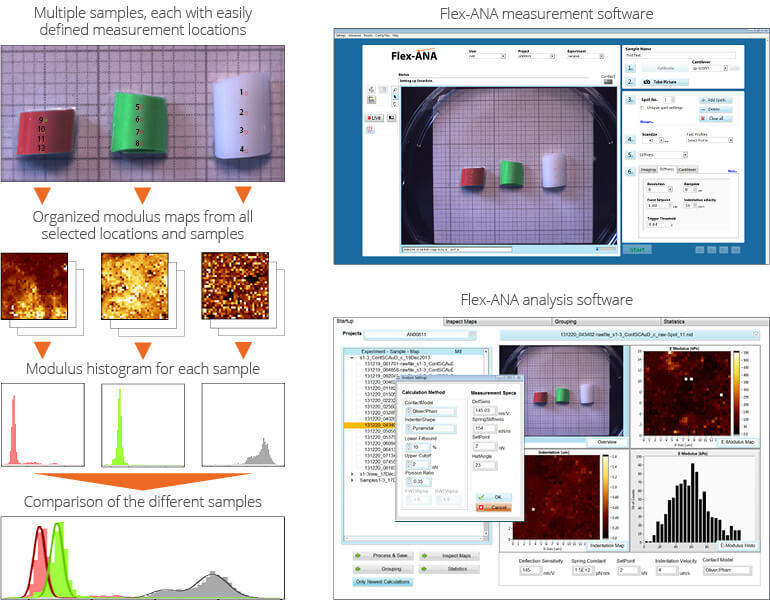 The modular concept of the Flex-Axiom also allows easy upgrades to other products of the FlexAFM product line (Flex-Bio for life science, Flex-ANA for automatic nanomechanical analysis, and Flex-FPM for cell and nano-manipulation) to further extend the possibilities of your Flex-Axiom research system. The FlexAFM video option integrates two cameras for parallel top and side view, allowing you to quickly find an area of interest and to bring the cantilever close to the surface before the final, automatic approach. Cantilever holders with alignment structures are available for use with cantilevers containing alignment grooves. This provides micrometer repositioning accuracy, circumventing laser alignment and allowing you to find the same sample features again and again, even when switching cantilevers during an experiment. NaioAFM — The leading compact AFM. The NaioAFM is the ideal atomic force microscope for nanoeducation and small sample measurements. More than just the successor of the well-known Easyscan 2 AFM, this all-in-one AFM system provides solid performance and easy handling, with a price tag and footprint that fit anyone and any place. The NaioAFM is AFM scan head, controller, sample stage, micrometer positioning table, anti-vibration solution, and measurement accoustic enclosure all in one! Because of this, there are no loose parts that can get lost or assembled the wrong way. This is crucial in environments with new and inexperienced AFM users. When the scan compartment is opened, for example to change the AFM sample or cantilever, the scanner is automatically retracted to prevent crashing of the cantilever into the sample when the compartment is closed again afterwards. Upon closing, a clever mechanism stably presses the AFM scan head onto a 3 point mount system and closes the acoustic isolation around the AFM sample and scan head. This way, the scanner compartment is effectively isolated from noise and air currents, and sample and scan head are connected via the smallest possible mechanical loop, all resulting in improved stability and measurement quality. The NaioAFM also has an AFM sample stage with sample positioners built-in. 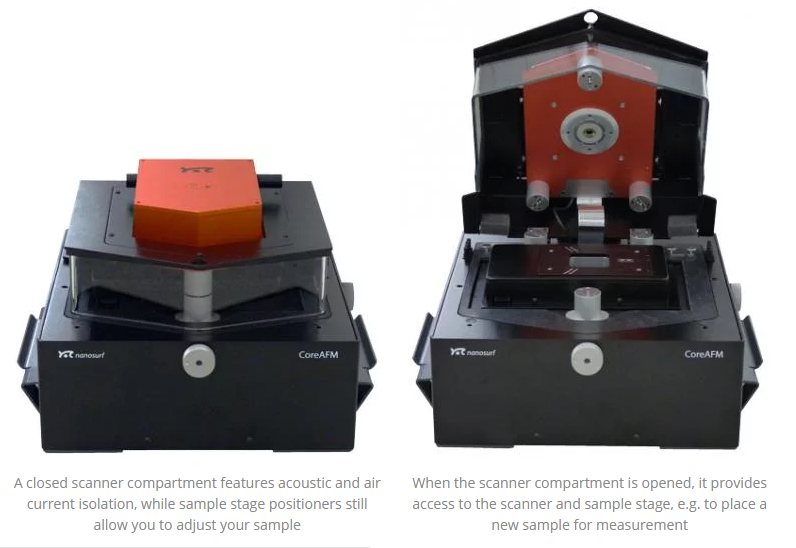 These positioners can easily be uncoupled from the sample stage itself after position adjustment, resulting in the AFM sample only resting on a mounting platform that is directly attached to the granite table at the base of the system. This heavy stone table and the additional passive vibration isolation feet of the NaioAFM further protect the measurement against vibration disturbances, making the system very robust during measurements. To use the NaioAFM, just plug in the power and USB cables, start the user-friendly software, and you're ready to go within minutes! No real setup is required. Check out our overview video to see just how easy this is. Because the NaioAFM comes with a cantilever alignment chip, cantilever exchange is really easy as well, and laser alignment becomes a thing of the past. Watch the cantilever exchange video to see how it's done. An additional advantage of the compact, all-in-one design of the NaioAFM is it's portability: the system comes with a carrying case that allows taking the instrument to another room, institute, or even on a train or airplane. It will be up and running at the new location in no time. What other AFM instrument gives you this amount of flexibility? You won't believe how easy it is to operate the NaioAFM. Well, you just might — after watching these extensive NaioAFM video tutorials. They will acquaint you with the system and will allow you to train yourself and/or others in the confident use of an atomic force microscope in any research or nanoeducation environment. NaioSTM — Thebest selling scanning tunneling microscope. Scanning tunneling microscopy is considered as one of the cornerstones of nanotechnology. Paired with the NaioAFM, Nanosurf brings nanotechnology to the classroom, providing insights in the fields of physics, biology and chemistry. 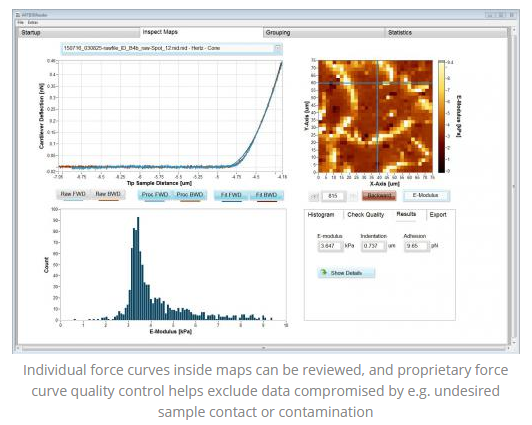 The Nanosurf Flex-ANA system is an automated solution for AFM-based nanomechanical analysis. It is designed to investigate the nanomechanical properties of materials such as cells, tissues, scaffolds, hydrogels, and polymers on multiple or large samples via force spectroscopy and force mapping in an intuitive and automated fashion. 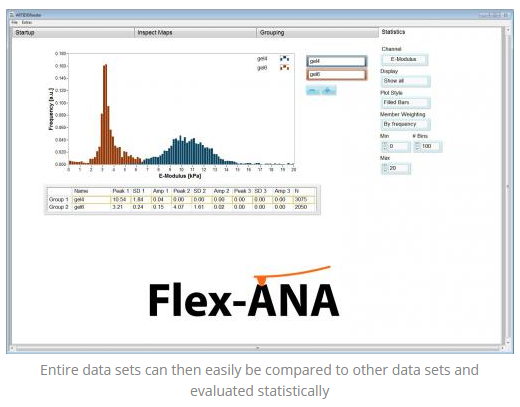 The combination of a straight-forward experimental and post-processing workflow, selected hardware elements, and thought-through, well-designed control algorithms are hallmarks of the Flex-ANA system. 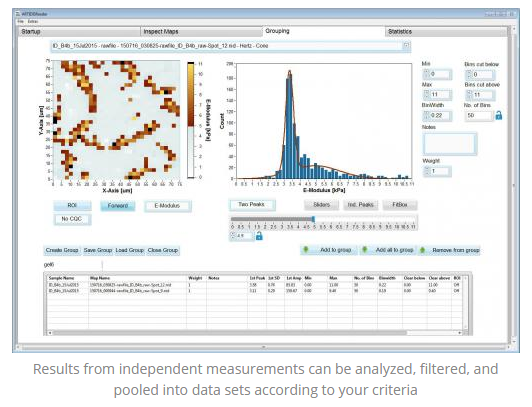 Measurement locations on large or multiple samples are defined using an overview image with a large field-of-view that covers the entire accessible 32 mm × 32 mm sample area. Height differences of up to 5 mm can be overcome automatically by the system! During an experiment, smart algorithms coordinate the movement of the scan head and the motorized XYZ translation stage (32 mm × 32 mm × 5 mm range), which can optionally be equipped with an additional 100-µm Z piezo for an extended spectroscopy range. To cope with large sample height variations, proprietary algorithms permanently monitor and optimize the sample position with respect to the probing cantilever and drive all Z elements accordingly. Thus, soft and sticky samples, as well as samples with macroscopic and microscopic roughness in the range of several millimeters and micrometers, respectively, can be easily addressed. Ask your question or discuss your application with one of our application scientists. Also see the Nanosurf application gallery or the sidebar with applications and publications on the right for more intriguing Flex-FPM and FluidFM experiments.